At Texas A&M Alpha Tau Omega, our recruitment philosophy is to identify men who are leaders that possess high character, sound morals, strong values and conviction. We expect our members to excel in the categories of leadership, academics, athletics, service and social events, and we expect potential members to do the same. We strive to recruit the best men to ensure a quality undergraduate experience, and to offer one of the strongest brotherhoods at Texas A&M University. Our recruitment happens year-round and we will hold multiple rush events during the summer as opportunities to get to know our chapter. 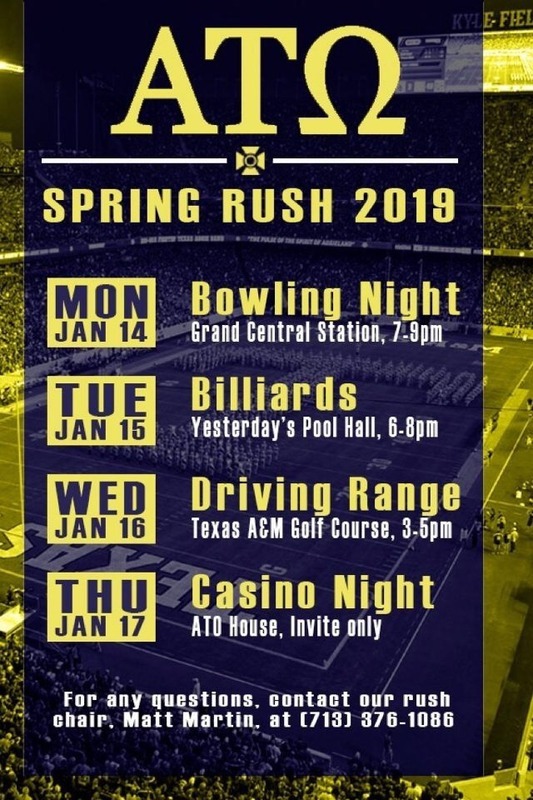 For more information on rush feel free to contact me at (713) 376-1086.